Agreat evening to sample wines that coudl grace any holiday table. If you are still looking for some bubbles for New Years then check out the Bodega Norton Bubbles 101 especially if you don’t like lots of bubbles. I especially liked the Alta Vista Classic Cabernet Sauvignon RSV, a not over the top cab and the Bodegas Olivares Tinto, a great blend from Spain. The cheeses were great as usual: Mediterranean Herb, Karst Cave Aged Cheese and Fromage D’Affinois Excellent Triple Cream. All yummy. 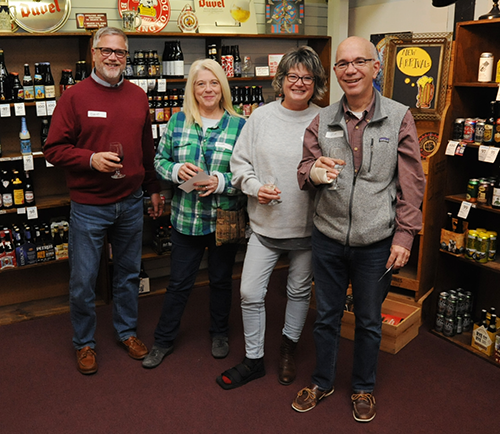 Next up for Wine World is their Third Thursday Tasting on Dec. 20. 100% Dolcetto from 1.5ha of vines grown in calcareous soils. Maceration with the skins for 4-5 days in steel vats with temperature control. Maturation in steel vats for 7-8 months. Finishing in the bottle for 1 month. 8,000 bottles produced. Ruby red in color with purple reflections. A fine, fruity nose that’s slighty spicy, with notes of ripe plum and bitter almond. Supple and fresh on the palette with good structure. Well balanced with a slightly bitter aftertaste.